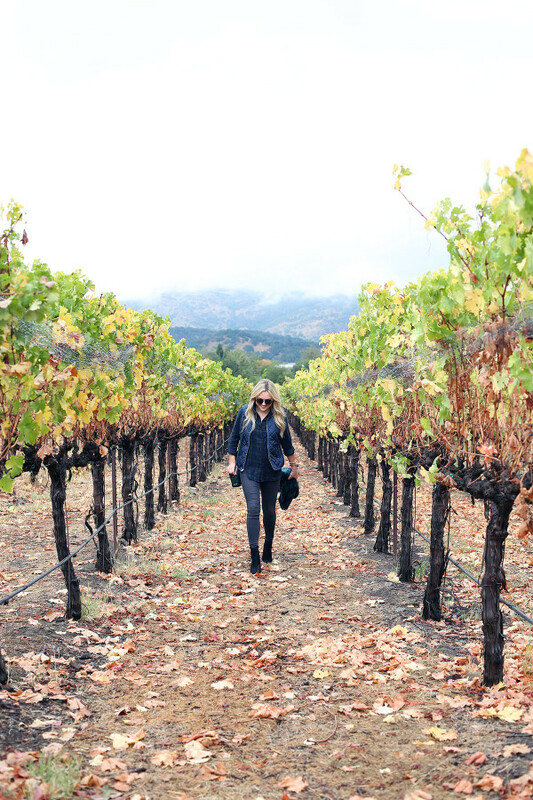 By the time we got to Napa, my mindset had totally shifted! Sure, it was a rainy drive with heavy traffic, but there’s just something about a road trip, good music, and girl talk to get you out of a mood, am I right? 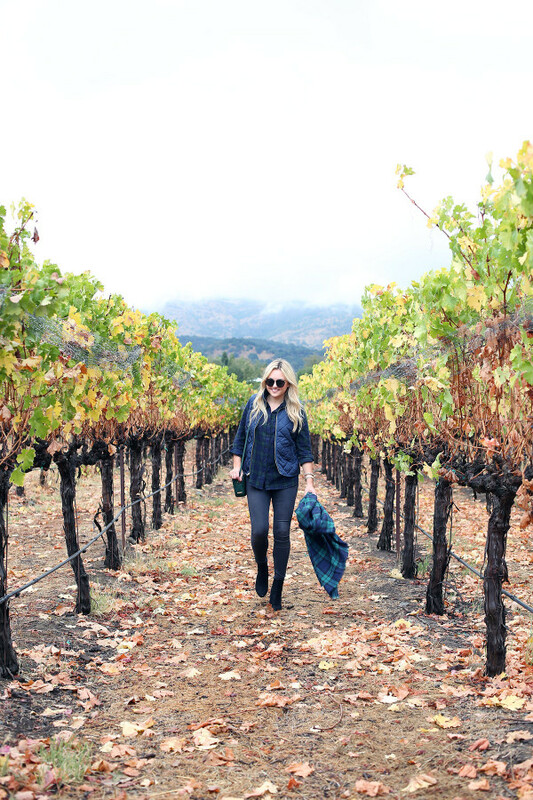 We had lunch, checked into our cozy bed & breakfast, and ventured out to start the afternoon of winery visits! Our travel luck turned around as soon as we got to Chandon! The rain stopped, the clouds semi cleared, and we were left with the most beautiful (and moody!) 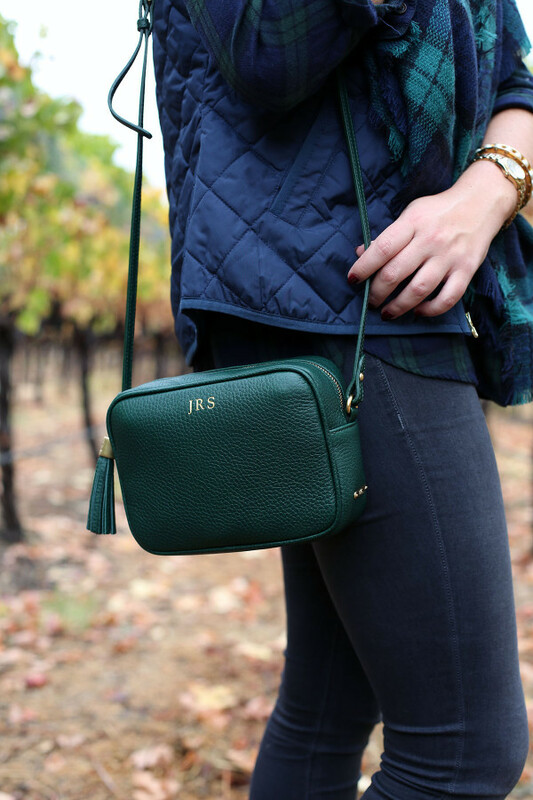 fall weather… We were even able to sit outside while we polished off 3 bottles of wine. (Hey, there were 6 of us!) While Chandon does tend to be a little bit touristy, the grounds are so stunning. 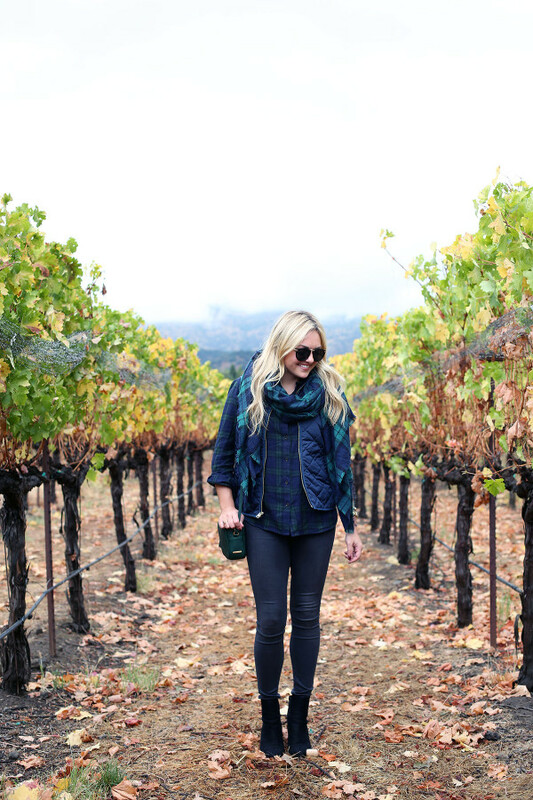 We couldn’t resist snapping some pictures in the vines! 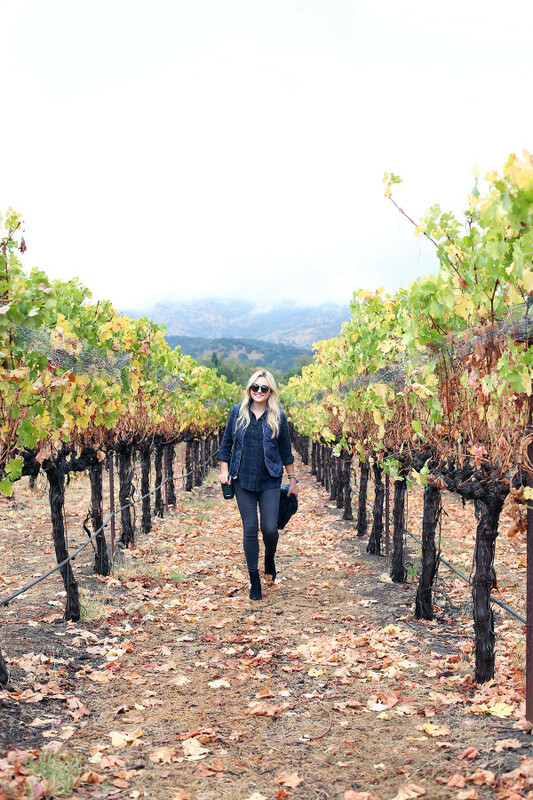 I’ll share more about our exact itinerary, where we ate, which wineries we visited, the late-night spots Hallie and I found, etc. Stay tuned! 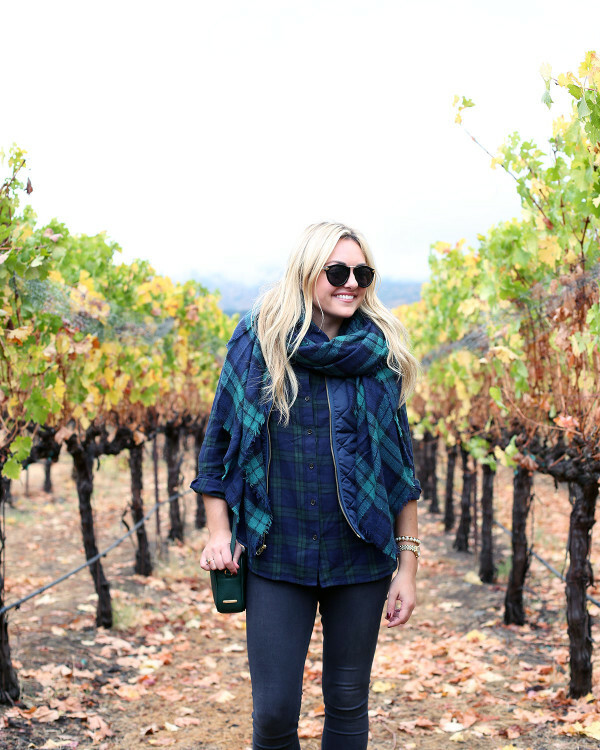 I wore a classic plaid shirt with a quilted vest and topped it off with a giant blackwatch plaid blanket scarf. (Can you believe it’s only $22 at Old Navy?! I need it in every color!) 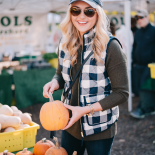 I love the look of plaid on plaid… Such a fun play on prints! I went with grey jeans to switch it up a bit and black booties to play up the black in the scarf. Heeled booties probably weren’t the best choice for the rain and deciding to venture out into the (muddy) vines… Need to find some suede cleaner ASAP! I love these pictures, I have always wanted to go to Napa!! I love this outfit and this place looks gorgeous! You’re looking sweet in this comfy and laidback outfit! Great photos! 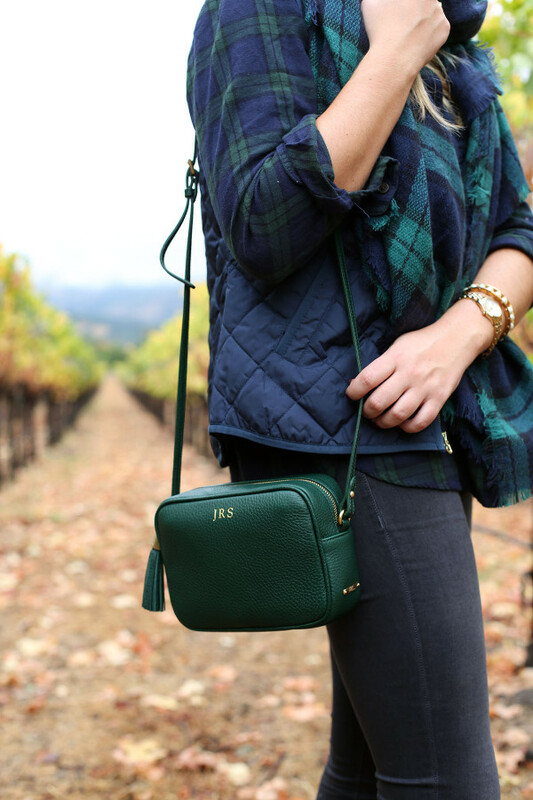 It sounds like such a rough start to your trip, but nothing like a little winery visit to relax, right?! 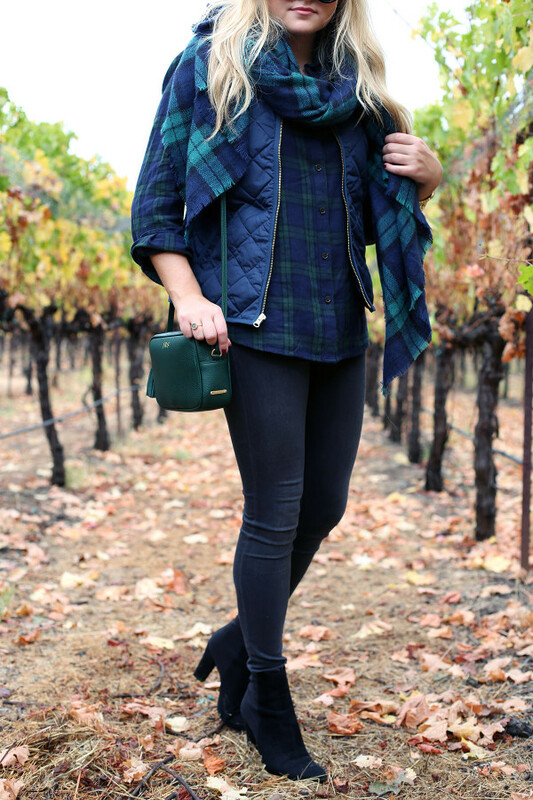 Love this mix of plaids! So cute! Sorry about the horrible weather. 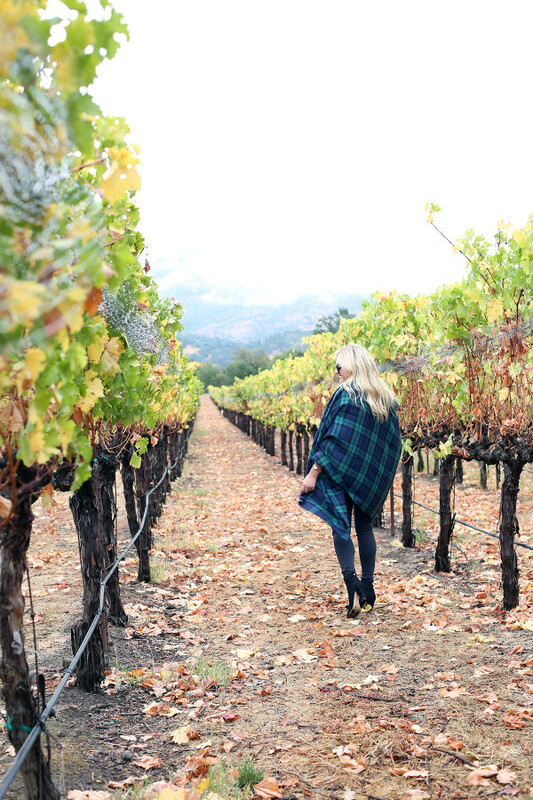 Napa is beautiful Definitely on my list of places to go. What a darling post! 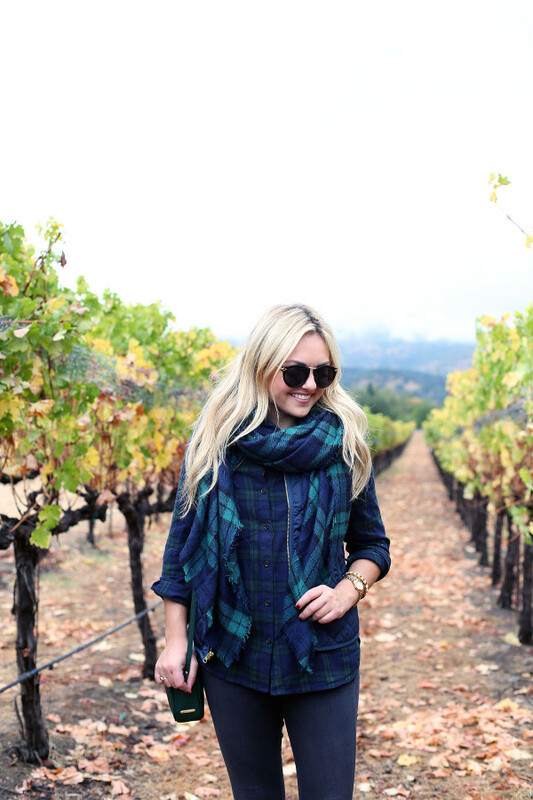 Live your plaid scarf! 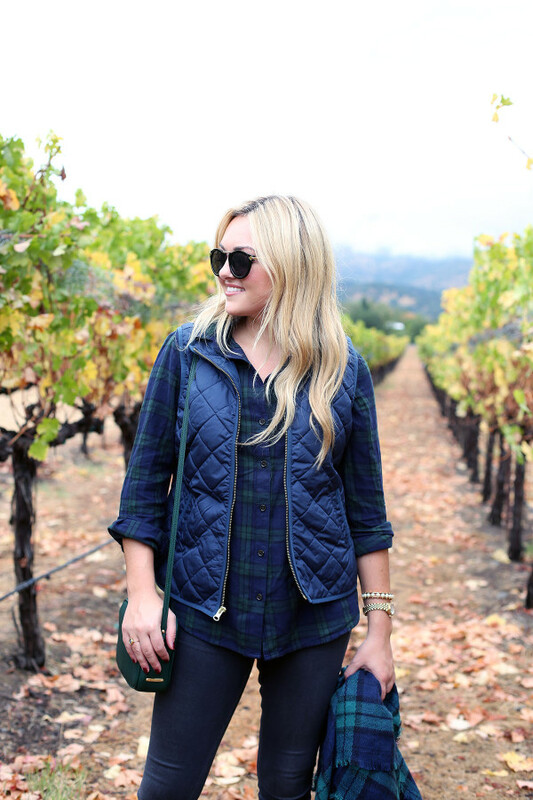 Quilted vests are the absolute best for fall! Especially in navy! This looks like such fun fall outing!! I think you have mentioned this before, but can you remind me what curling wand you use? Thanks! 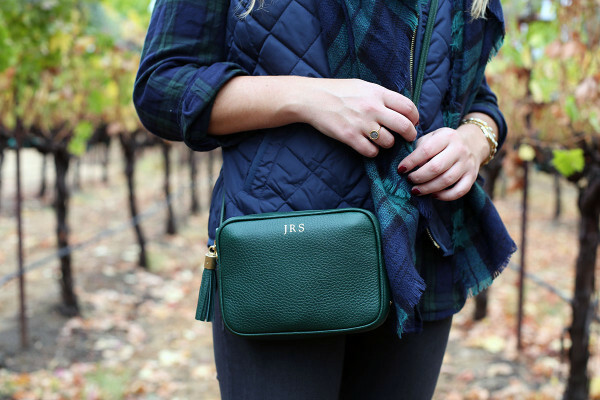 That purse is adorable! 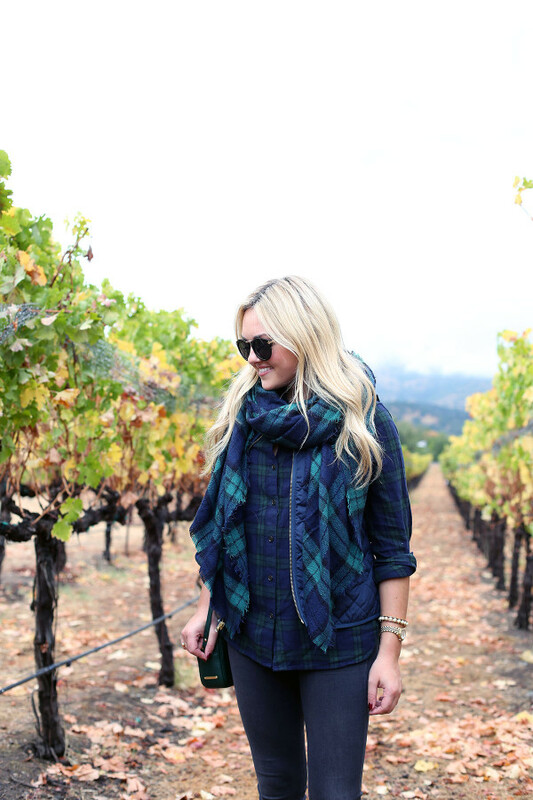 Napa is great in the fall! 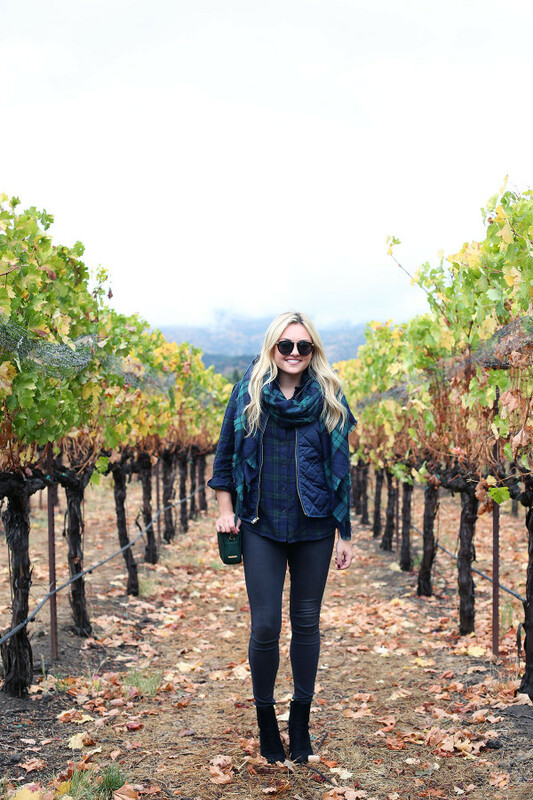 I’m glad the weather cleared up for you and you were able to enjoy your trip to Napa. I’m loving that plaid scarf, by the way! The color palette in these photos is picture-perfect. Can’t wait to go back! 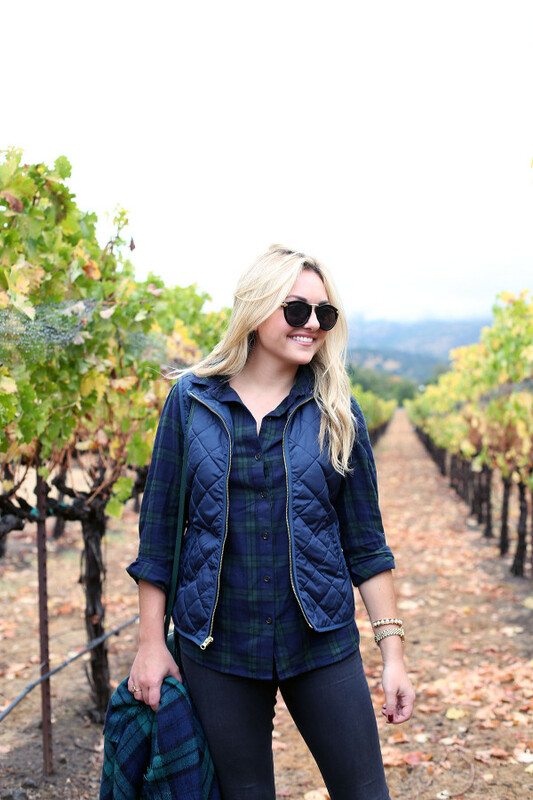 Ana’s better be in your Napa guide…. Lolllll. This is an outfit I would totally wear every day of the week. Sounded like the trip was well worth it in the end. I can’t imagine being stuck in an airport for 17 hours, though. 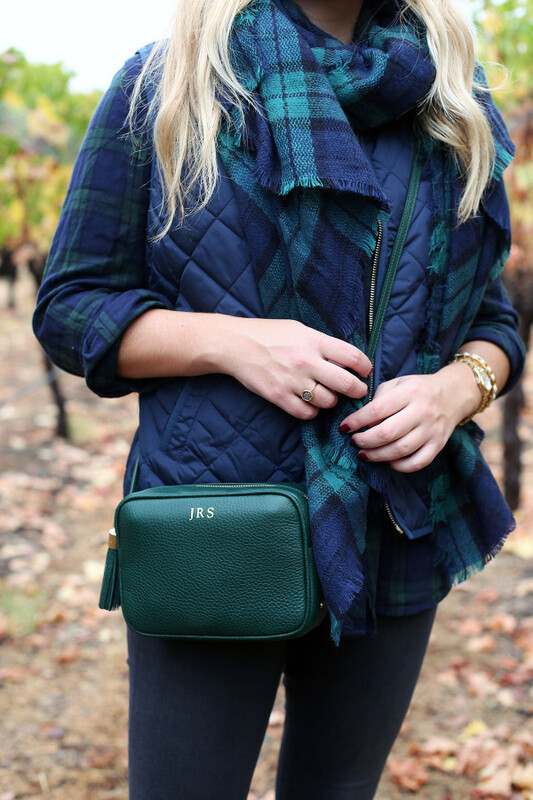 Love the hunter green and navy tartan color combo! These pictures are awesome! I have a wedding to go to in Nappa and cannot wait! I was there (Napa/Sonoma) over the weekend as well. Can’t wait to hear where you visited. 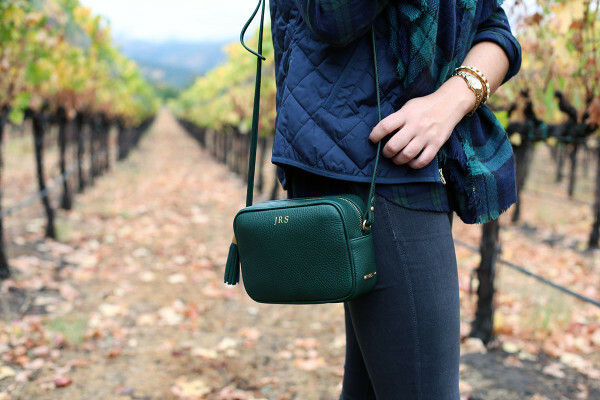 Napa is the best, right!? We just got married there in June and it was so dreamy! I completely relate to this post: everytime I travel, there is always a glitch. Or like 20. Glad you had fun and you look nice too! I don’t have words to describe how absolutely I found your look perfect. Everything about him is beautiful. It’s something beautiful and exactly how I like to dress, as you can see on my blog.